On Sunday, April 26th in his Kitsilano home, one of Vancouver’s beloved artists was found passed away, with his beloved dog Hendrix by his side. The neighbourhood was shook up after hearing that one of their treasured souls had passed on. Brent Grassie was a remarkable person that touched the lives of so many people and animals around him. 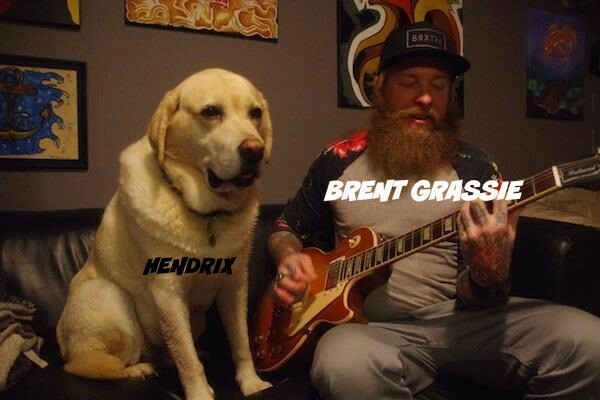 Often seen walking around Kitsilano with his beautiful blonde labrador Hendrix, the two had become staples of the community for over a decade. Grassie left his hometown of Winnipeg, Manitoba for the beach side town of Kitsilano, and never looked back. Although his life was cut short at 38, he lived a thrilling and entertaining lifestyle. Grassie was a rock’n’roller, visual artist, stage hand, actor, biker and skateboarder. There was nothing Grassie couldn’t do. Earlier this year we had the opportunity to feature Grassie as one of Vancouver most under appreciated artists. His work has been seen in various coffee shops, restaurants and even on children’s clothing. Grassie was a dear friend to so many people and his time was cut short. We wish his family and friend the very best in peace and happiness.